Located in one of the oldest parts of San Miguel near the Charro, still in El Centro. 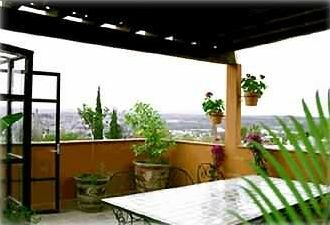 This lovely small home has a roof garden, on the fourth floor, with a splendid view of the sunset over looking El Centro. Live on the roof amongst the orange trees with a panoramic view. Great location. Walk to everything. The master bedroom, on the third floor, has a balcony as well as plenty of closets/drawers and a cable TV. The kitchen/den, on the second floor, has a lovely breakfast area, cable TV, small balcony, lots of windows and a comfortable sitting area. The first floor entrance has a study/office as well as a bedroom and bath. Wonderful hand made furniture and great art work throughout. My parents died when I was in my 20s, and my mother asked my uncle to take over her parenting responsibilities. He was very artistic and in the 1950s became very involved in the Instituto Allende. I never got to San Miguel, though. I was a young lawyer, always working. When my uncle died, he left me his paintings. Seeing them opened up a longing in my heart. I took my family to San Miguel, and the connection was instantaneous. Four days later, I bought a house there. This house, which is historic, is three stories but very tiny. The furniture had to be constructed off site and then assembled inside. The true pride and joy of my restoration is the roof garden. When the sun comes up, you hear the church bells toll, dogs bark, and roosters crow. Squealing with delight, kids burst from their houses to play or go to school. And a golden light spills over the buildings. It is in those moments that my uncle is so alive to me. I hear what he heard and see what he saw. In short, I understand. We enjoyed our stay at Callejon de la Garza #23. There were four floors including the Terrace with three bathrooms. A kitchen with a four burner gas stove and more than adequate kitchen supplies. We spent three months here and enjoyed our time. The metal winding staircases are more suited to younger clients. The Terrace with washing machine had an extensive view of San Miguel. There are three small Tiendas within a very short distance. The Shrimp Tacos at El Manantia one block to the West are excellent. The Jardin is about 1/2 mile away (10-15 minute walk) downhill. Our landlord Frank was very cooperative and easy to contact. The maid Ana came twice aa week to clean and change sheets. Beautiful views from the rooftop. Great location. Comfortable. Clean. Frank is easy to deal with and the local management and maid service are great. You need to be able to manage stairs. This was lovely home in a beautiful, safe and quiet neighborhood close to Centro. View from the roof top was fantastic- great place to watch NYE fireworks! Great location, comfortable, very pleasant. Staff was very responsive to our needs. Would definitely stay there again. We were 3 women traveling with a child to attend a wedding. We arrived to the property in the late afternoon and could not open the door even though we were following the lengthy instructions provided a few days prior to our trip. Finally, our driver was able to open the doors and we went inside a place that was not clean to our standards, the fans were full of dust as were other areas of the house, not a good place for someone with allergies. The stairs were very narrow and impossible to bring an average suitecase to the third floor where one of the bedrooms is located plus the child was afraid of the stairs. We were concerned and decided to find a hotel. We met with the owner the next day who offered to have the place clean and the keys fixed but it was already too late, like someone said: "You never get a second chance to make a good first impression". We did not feel comfortable staying there. We kindly asked him to reimburse us what we have paid, he denied the request and identified himself as a lawyer which made us feel somehow threaten. He agreed to pay for one night hotel and to try to rent the place for the weekend which he did not do. On July 7, the house still appeared as unavailable for the weekend. We committed to try to sublease it so we asked the bride if she knew anyone in her party who could need a place but as expected everyone had already a place to stay. We did not know what else to do so we stayed in a nice, small, clean hotel and enjoy the wedding and all festivities we were there to enjoy. If you are going to rent this place, before you sign the contract, please ask for the detailed instructions they provide before the arrival. If we have had those instructions beforehand we would not have booked this place. We have to admit though that it has a beautiful and wonderful view of the city. Unfortunately, the renters did not give us time to rectify the dust issue on a very high ceiling fan. Our maid has now purchased a tall ladder to keep this high fan clean. We have updated all the locks to simplify the keys. Photos of the stairs are clear and available on this site. Renters decide their ability to climb such stairs before booking. We have never had any issue with renters booking the condo and complaining of the stairs on arrival. We encourage our renters to view all photos and ask any questions prior to booking. We also work with our renters to fix any issues once they arrive. My first visit to SMA was to visit a family member who has lived there 10 years and speaks fluent Spanish. That was a big help although there are many ex-pats in the city and most locals speak varying levels of English. It is a beautiful city architecturally and was wonderful to walk hour after hour with cafes and restaurants at every turn. I will return for a much longer stay next visit. The botanical garden was a delight and the only foray out of the city during a 4-day stay. The house was charming, on a quiet street and outfitted with everything one could want as far as Wi-Fi, electronics, TV, landline phones and kitchen equipment. SMA is quite hilly so be prepared to walk up and down streets, either along narrow flagstone sidewalks or uneven cobblestone streets (slippery when wet). Be aware the house is tall and narrow with a spiral staircase connecting 4 levels. Views from the 3rd and 4th levels are particularly lovely with the 4th level a rooftop patio. There is a lot of up-and-down stairs with cumbersome use of color-coded keys for more doors and locks imaginable. Upon arrival, the keys supplied by the owner did not fit the outside door and the efficient house manager arrived to let us in. Be sure to have a cellphone to receive and make calls and texts in Mexico or you're out of luck. Rates are subject to change until the reservation is confirmed and the deposit is received. DEPOSIT: A $100.00 refundable deposit is required for stays up to two weeks. A $250.00 refundable deposit is required for stays over two weeks, up to one month. For stays longer than one calendar month, please contact us about the amount needed for a deposit.